From the images, it’s difficult to discern the make and model of the car. 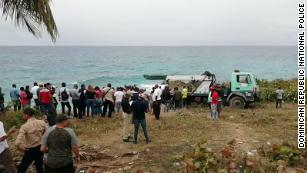 Upholstery, cables and other debris appear to dangle from the car as it was pulled from the sea. Locals describe that zone as “la batidora” — the blender — because of the rough seas normally found in the area. Duran Mejia said a black iPhone was also recovered. It’s unclear where the phone was found in relation to the car. Searchers recover a black iPhone from the waters where the couple went missing. 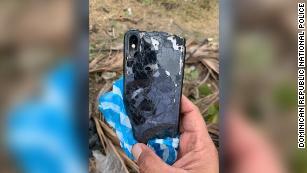 A photo provided to CNN by Dominican Republic National Police showed the back of the phone was shattered. The word “iPhone” is clearly visible. The agency is tracing the phone to figure out if it belongs to Moore or Ravenelle. Police are still working to identify the body they believe is Moore’s, but they say they are sure both bodies of the missing pair have been found. Moore’s friend, Francesca Figueroa, told CNN she confirmed to the police that Moore has a tattoo with his daughter’s name, “Milan,” on his arm. People gathered at the extraction site.